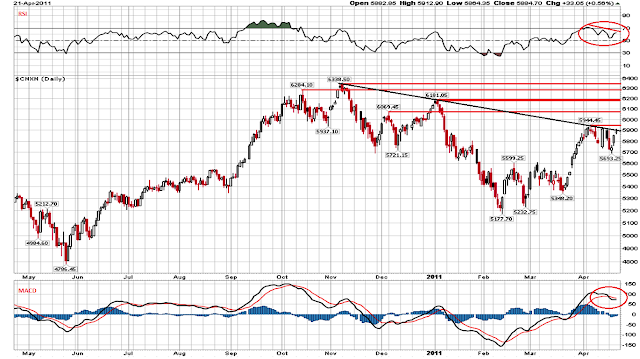 Nifty Daily Chart: It could be an interesting week ahead for Nifty, as we move on to a cluster of previous resistance zone. Prices at these levels have failed to cross over and has made a major move downwards. Prior Resistance are at 5944, 6069, 6181, 6284 and 6338 and my pick from the lot is 6181. It is from this level Nifty fell furiously last time. The factors that might restrict Nifty to move towards 6180 mark are (a)negative sloping trendline still holding on; (b)negative divergences that we see in RSI; (c)MACD has turned negative, however not that bearish; (d)the upper band of the keltner channel coincides with the prior resistance at 5944. We will keep you posted as the Nifty unfolds and give us a clarity on its move.